What Country you know the most associated to Europe Continent? If your answer is France, then you are not alone. There are more than 87.3 million peoples who think the same way as yours when they are visit France. In fact, based on Worldatlas.com or Travelersdigest.com (and lot more), the most visited country in Europe is the one and only, France with more than 80 million peoples in a year (spans 'only' 643,801 kilometers square with population only 67 million peoples in January 2017-imagine how this land is crowded with tourists!). Compare to Indonesia in which total visit are only 10 million foreign tourists per year packed in 1,904,569 square kilometers wide, then you can imagine how France packed with tourists and outnumbered its population. May be one of the reason why France become the most visited country is because of the easy-accessibility of France from many aspects like visa requirement, transportation, information, 'propaganda' and etc. That's why we also applied our Schengen Visa via France due to the simplicity of documents required, processing time and friendliness. The first Europe country to land from our current journey is Paris. Arriving in Charles De Guille Airport after almost 15 hours flight from Kuala Lumpur via Emirates, didn't retire us at all. Since we arrived still at noon, we hurried our self to reach downtown as soon as possible.But unfortunately, there is a trouble from the train provider so there were long queue of peoples from Airport to downtown using bus services. After using bus we continue using train in RER B routes to reach Palisaeu. We've got lucky in Paris because we have acquaintance whom offered to share their spare room in their apartment with us. From CDG to Palisaeu (place they live) can be reached by RER B. Palisaeu is residential area outskirt of Paris where most of locals built their home landed instead of apartment. The sight along the train routes are magnificient where finally I got a glimpse how working class of Parisians live their life. To be honest, the residential areas looks cleaner than downtown Paris where many beautiful building lies. While Paris maintain the originality of buildings which is strongly influenced by Renaissance. The ordinary Paris house of the Renaissance are four to five stories high, narrow, built on a stone foundation of wood covered with plaster. Long time ago, attics in these buildings were used for maid room. 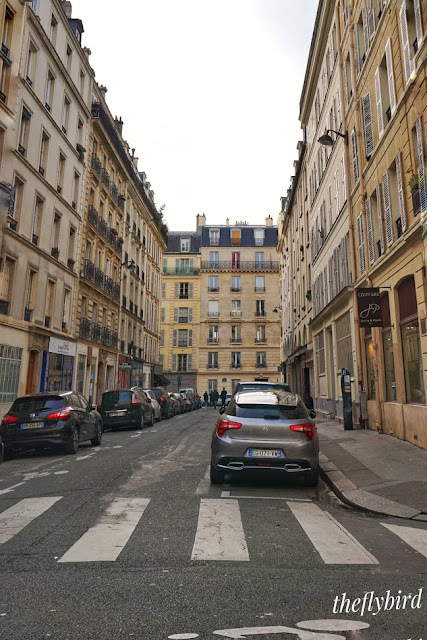 Then now, when rent fee for apartment in downtown Paris is sky-rocketing, the attics also available for rent with the cheapest fare among other floors. 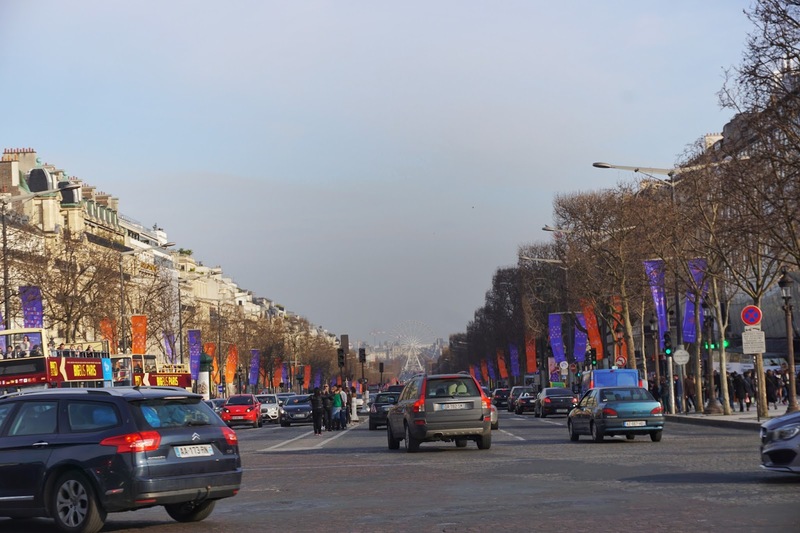 Most of Paris transportations are covered by Metro (subway line) which have flat fare at EUR 1.90 for 3 Zones. Meanwhile there is also Suburban Express Railway (electric train) to/from Paris which also called RER. 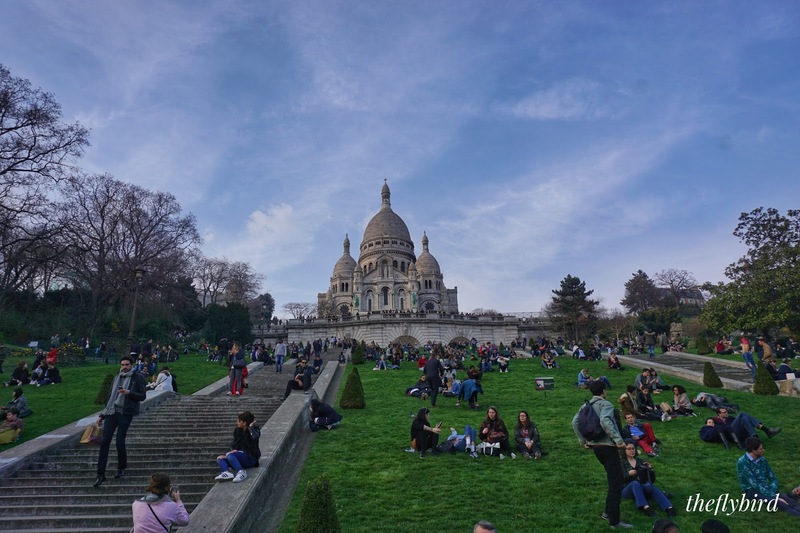 Since there are many tourism attractions to define the beauty of Paris, I just follow the popular destinations like Notre Dame, Eifel, Triump d'arc, Siene River, Sacre Couer, etc. Plus I won't go far from my current interest i.e. Books or Movies, and Buildings since France is the place where architecture style born like Gothic Style. 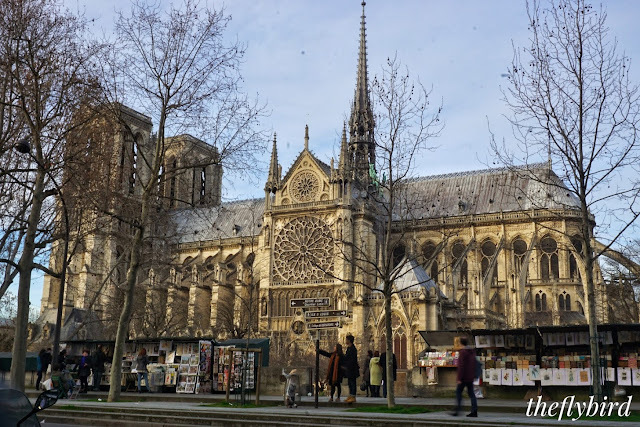 My first route to explore Paris is the famous Notre Dame Cathredal. Located near the bank of Seine River, the cathedral is grand and strong with Gothic architecture influence (What is Gothic anyway?). To be honest, I don't know much about art-architecture-style, but i just simply love trivia (and read) to know enough about Gothic Architecture. Also, the reason why I know gothic is simply because of many gargoyle in there.If you love to read fantasy novels then you won't be strange with Gargoyle terms (the-demon-panther looks sculpture). Gothic architecture itself is widely used in Churches architecture especially in Europe countries (also built in several city in Indonesia during colonialism). Two big towers at the upfront combine rose windows are the easy way to spot this architecture style. When we arrived there on the afternoon, the queue to enter the Notre Dame tower is quite long that I'd prefered to pass it. But at the next morning when we arrived before 10 o'clock, the queue wasn't killing much. I only queue for good half an hour to enter the Notre Dame tower and find the very beautiful view of Paris landscapes in 360 degrees. Paying approx. 8-10 Euros (forgot the exact amount), we climbed 367 stair steps to see the most famous bell and its gargoyle up close as well as having a spectacular view across Paris. 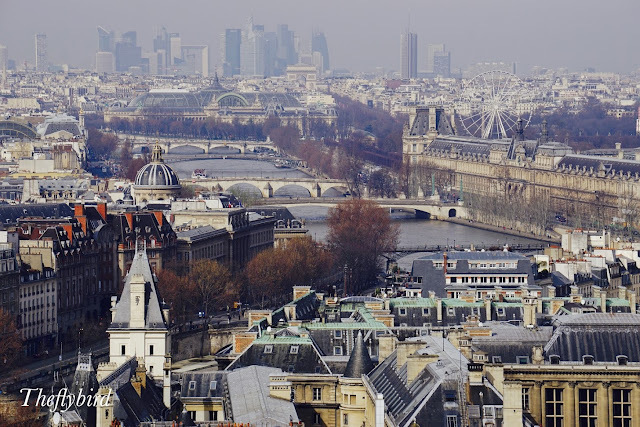 From the top, we can see the high rise Eifel Tower dominating the sky, the famous Basilica Sacre Cour and the density of Paris City. Well, even we tired, but climbing for 367 stairs is surely paid off. Not only enjoying the view, we also amazed with the detail of sculpture at the roof of the Cathedral. From the left side of Cathedral, Seine River is flows calmly and divides Paris City in brown liquid line. We could stay at the top at maximum 30 minutes then we should go down to give another batch enjoying the view. 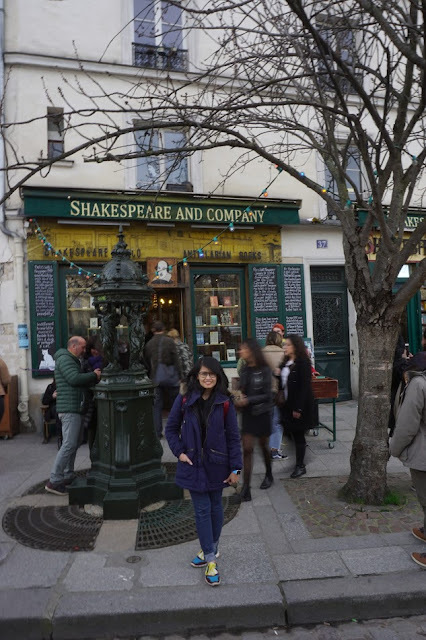 Right across the Seine River over Notre Dame Cathedral, there is a famous bookstore, Shakespeare and Company which also crowded with tourists. If you love Before Sunrise movie, then you will notice this spot right away. The Green-Yellow Colors are never changed since its built (of course it is older than you or me). Shakespeare and company also famous for the complete and unique collections for English and France Books. Actually I found one quite rare book regarding Haruki Murakami and made me ecstatic buying it. Still, in the complex of Notre Dame, there is line of secondhand books sellers in which majority French book is sold. Walking down to the Seine River, I saw a lot of Parisians is enjoying the sun light. Actually, the weather is nice (about 12-14 degrees Celsius), the sky is little bit cloudy and covered by mists yet the sun shone very bright. The Seine River itself is not clean or dirty. The water colored dark brown which mean bring lot of soil material, but there is no garbage floating on the river. The river is not smelly and I didn't found someone fishing at the river. The river border itself quite wide so people can do lot activities in there..like just sitting, chilling, running..or kissing. 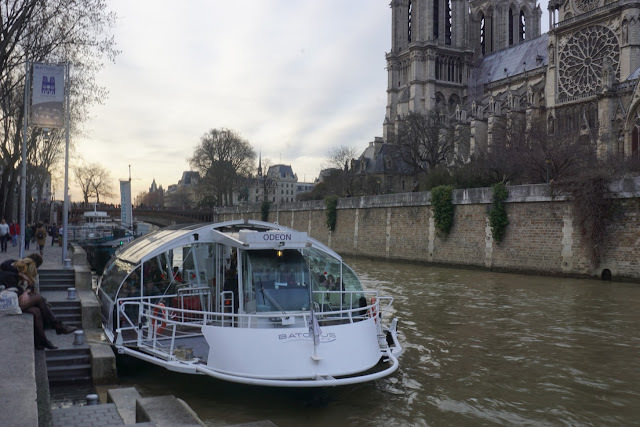 Riding Batobus, we departed from Notre Dame to the famous Louvre Museum. Since Husband had done it before, we didn't go inside (because we only one full day in Paris). We just take pictures, enjoy the glass pyramid, the grand architecture, the france garden and of course the famous Arc de Triomphe du Carrousel. The Louvre itself become very famous thanks to Trilogy Davinci Code. The Louvre Pyramid standing beautifully, very contrast with its modern architecture surrounded with France Renaissance Architecture. Since I arrived from the right bank of the river and seeing the grand, beautiful building-squaring like fortress made me questioning the history of Louvre Museum. In fact, long time ago, several kings in France used Louvre Palace (now Louvre Museum) as their residents. 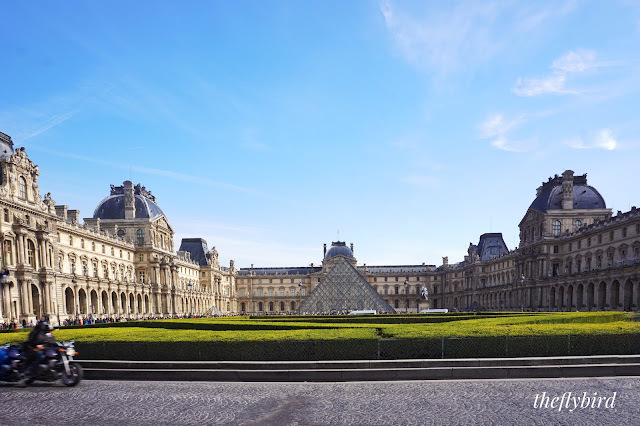 The Louvre was constructed in a span of over three hundred years exemplifying traditional French architecture since the Renaissance. Most of the structures that make up the museum follow in the style of French Renaissance (actually copied from the Italian Renaissance and Baroque periods). From King Francis I to Henry IV and Louis XIII it was added onto and finished up under Napoleon III, with most all recognizing that Italy was the great school of both classical and Renaissance art. Leaving Louvre, we back to Batobus and went to the next destination, shopping centre, Champs Elysees. We walked quite far from the Batobus station (approx. 1 kms) while enjoying nuttela creepes and of course line up of (expensive and branded) shops. One kilometers long is nothing when we finally saw Arc De Triomphe standing so pierce in the middle. 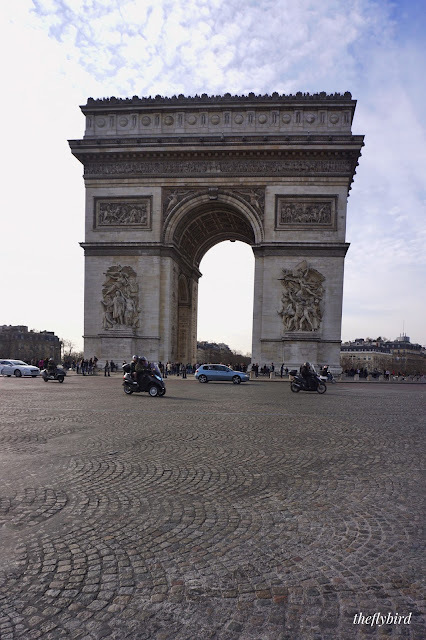 The Arc de Triomphe is a monument to honours those who fought and died for France in the French Revolutionary and Napoleonic Wars, with the names of all French victories and generals inscribed on its inner and outer surfaces. Beneath its vault lies the Tomb of the Unknown Soldier from World War. People suggest us to climb Arc De Triomphe to see the other perspective of Paris that didn't captured at Notre Dame tower. But when we arrived, its almost 5 at the afternoon and the queue is quite long. We decide to go down to the Metro Station (Charles de Gauile de Etoile station) to Basilica Sacre De Couer (Anvers Station). This beautiful Church lied at the highest point of Paris, that's why we should climb quite long to reach it. Yet, in fact, our friend told us (when we already at the top) that we can reach the church via lift instead of stairs. The white building looked so contrast with green grass and blue sky. The view from the top also amazing. 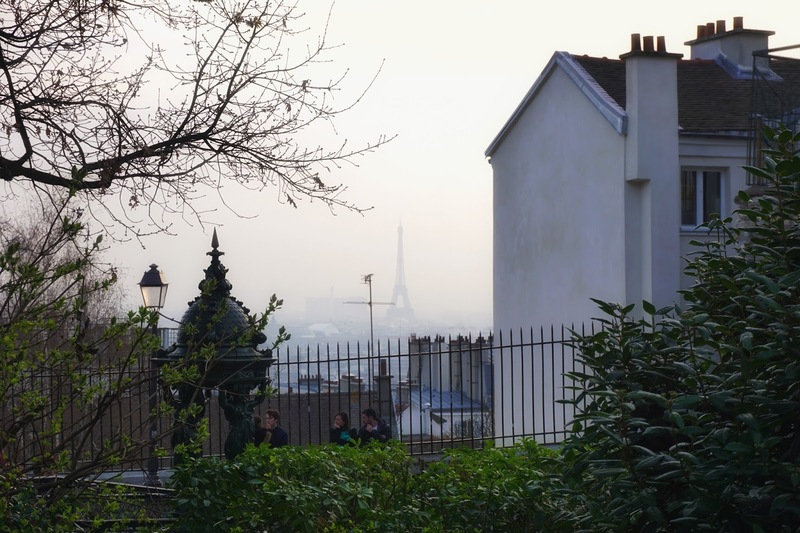 When we walked to the left side, we can even see Eifel Tower (but covered in mists). Finally, before I end this story, of course there is a story about the most popular landscape, Eifel Tower. The tower is 324 metres (1,063 ft) tall, about the same height as an 81-storey building, and the tallest structure in Paris. Since it is the most popular landscape in whole world, it is almost impossible to ascend the tower without queue. The waiting time also spectacular that one simply cannot queue in the same day. even at 4 o'clock in the morning (my friend tried it), the queue still looooong. 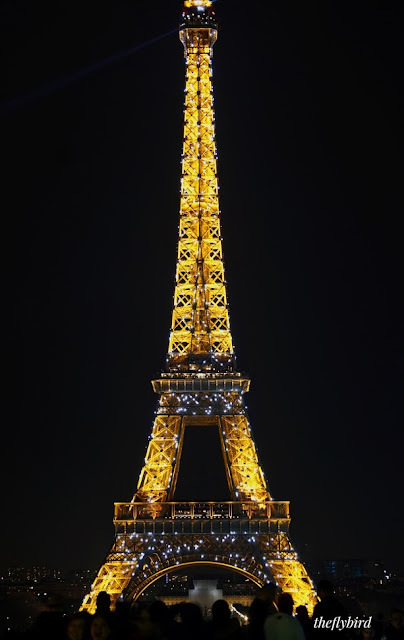 There are two photogenic spot to capture Eifel Tower, one of course from Eifel Tower backyards itself, and Troca Dero. Well, that's a wrap then. 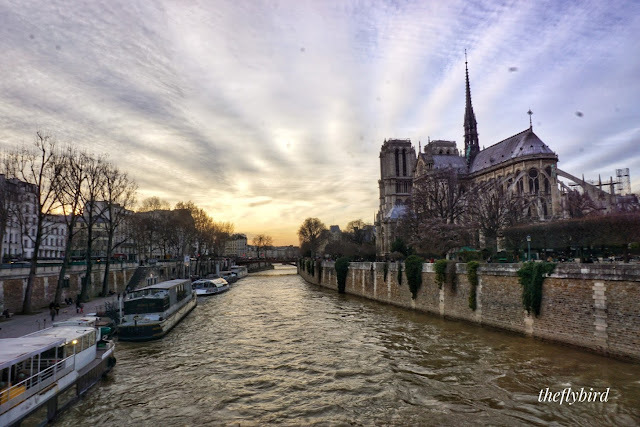 Paris in one full day visiting the most monumental landscape in Paris. My heart absolutely goes to Notre Dame Tower because the striking view and the originality of Paris. You can see also my full itineraries during Euro Trip in here. Also, of course wait for my next post in Iceland!! !